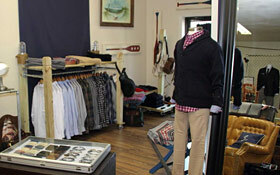 Located about an hour outside of Boston, WHARF is a welcome oasis in the barren menswear market that is New England. 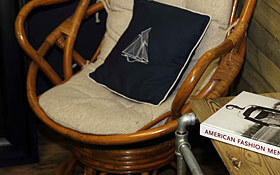 Founded by Rob Babigian, whose family has tight ties to the seafood industry, WHARF has a nautical feel to it. 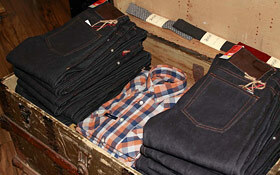 Stacks of shirting are bookended by manila rope and pilot lights, while a pre-WWII Marine chest holds raw denim. Rob may not come from a traditional fashion background, but his outlook on what makes a great store is tough to debate: "Service. Selection. Service," he told us. Here, Rob shares some of the best gifts he's stocking this holiday season. 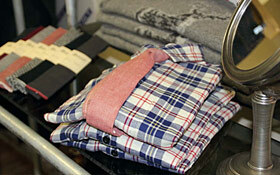 WHARF's in-house, single-needle stitched, 100% cotton shirts, made in the USA—one for every day. Chukkas should be a staple of a man's footwear, and this winter Boot Co's version toes the line between simple and sophisticated brilliantly. Baldwin's original straight leg fit. Raw, dry and made of 13 oz. White Oak Plant Cone Mills denim—not too heavy and oh so wearable. 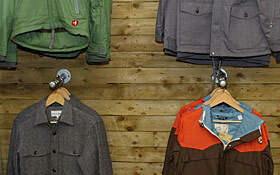 The best value this season is Dunderdon's Winter wares. It was hard to feature just one. This is it. The Adan chino is a best seller for a reason—the 4% elastine in the cotton and the slim fit are a deadly combination that really flatter most guy's shapes. Handmade in a river in Tennessee. As authentic as leatherworks can get. Jason Gregory's leather goods may get more attention, but it's MAKR bags that are the quiet workhorse of the line. Steven may be known for his reverse-seam shirts, but it's his heavier layers we want this season. Woolrich wool/deerskin leather exterior and Cashmere/Lambswool interior and a flip-top thumb? Perfect old-school meets new-school accessory. The Tournament Crew from life/after/denim or the "Oh Dear!" Crew from GANT Rugger give you the perfect option over an OCBD.